Twenty five year old Scott Sloan will join the British Rally Championship with his newly acquired Peugeot 208 R2, as he enters the ultra-competitive Junior BRC ring. “It’s always been a dream to do the BRC. I am 25 now, so it’s now or never to do the Junior BRC. It’s really, really exciting – the rallies on the calendar, the buzz and the competition is going to be unreal. When you get the chance to tackle this famous championship, you have to just go for it. The BRC new boy may be the most green when it comes to experience, but that’s not going to stop him from getting into the mix with the established names in the series. Along with co-driving brother David Sloan, the pair can’t wait to get stuck in as Scott explains. 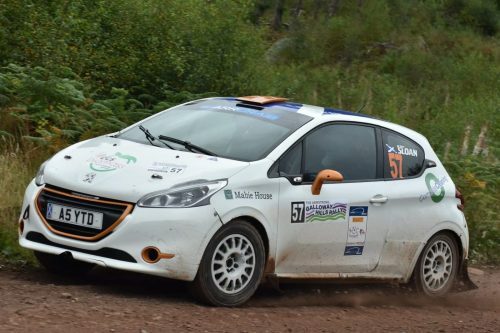 The Scottish driver comes into the JBRC with five years of front-wheel-drive experience behind him. Sloan is under no illusion of the new challenge awaiting him with his French pocket-rocket. An excited Scot but his registration on Deadline Day and is reveling in joining the BRC and is keen to show his speed, but he knows the challenge facing him. A mature approach will stand him in good stead for the year ahead. “My aim this year – I have to be realistic. Some of the guys have 4 years in these cars. I don’t have four events yet. It has to be about continuous learning and get to the end of these events and points would be nice.